Crack the egg into a bowl and boil some water in a saucepan. The pot should be at least half way full. ( I usually go for 2/3rds) This is a lot more water than necessary, but it make the other steps easier and the risk of breaking the egg when serving is decreased. If you want, you can also add salt to the water. 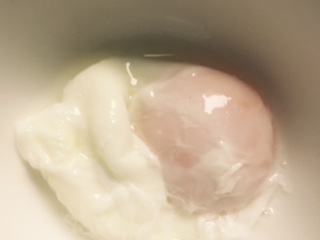 When the water is boiling, vigorously stir the water and very gently slip the egg from the side. After 4-5 seconds turn the heat down so the water is no longer boiling, add water if necessary. Violent boiling with prevent the egg white from gathering together. Have you ever tried Poached Egg Sandwiches? Oh, they taste so yummy!